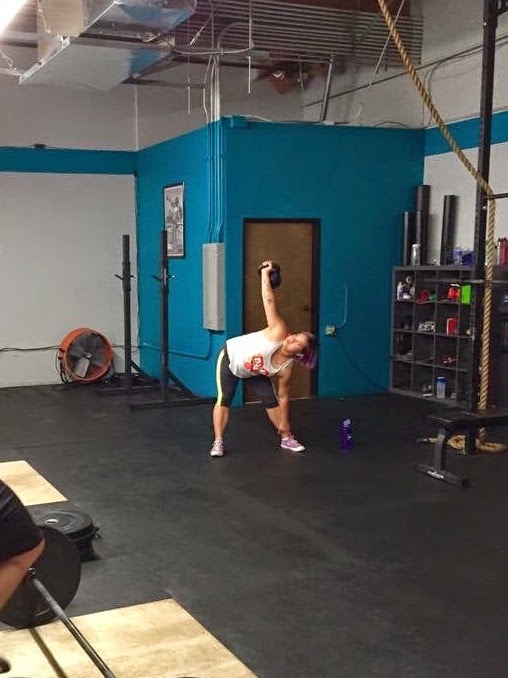 I started training at Anchored Strength & Conditioning in November in preparation for the California International Marathon (which I ran in December on my birthday). At the time, I hadn't done any strength training or cross-training for quite a while (aside from the random yoga or Crossfit class), and I was eager to build on the good work I had been doing with my runs - I wanted to be strong enough to finish under 6 hours, which meant dropping at least 30 minutes off my previous best time, and I didn't want to feel like I was (totally) dying by the end. Plus, I really only like lifting. I found myself only wanting to show up on days when there were deadlifts or squats in the program, and skipping pretty much everything else. I'm awful at pushups and burpees, and hell no can I do a pull-up or double-unders. I found myself thinking, "Why can't I just do the stuff that I'm good at right now on a consistent basis - lifting - and then slowly build upon the other stuff as my fitness level improves?" Well, it turns out that I can. 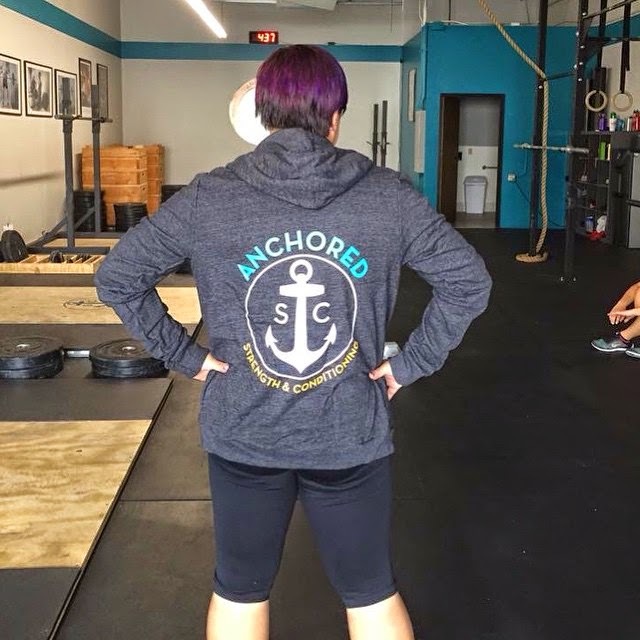 I remembered that one of my Crossfit coaches, Steve, had opened up his own gym nearby, and after some research (aka, stalking his website) and some emails about my goals and interests, I decided to check out Anchored. A bit about how Anchored works: there is a workout programmed for every day, but the workouts build upon each other week to week, and at the end of each cycle, we test our 1-rep max weight for specific movements. There are two levels of workouts programmed, so not everyone is doing the same thing, and on top of that, depending on your goals/situation, Steve will modify the workout to suit you. For example, when I first joined, I was kind of back to square one with strength training (in that I hadn't done it for a long time) and I was looking to support my marathon training rather than make lifting the main focus of my fitness. So, for a while, I was doing something slightly different from the regular programming that the others were doing - movements that were specifically good for runners, that weren't too heavy or difficult that I couldn't run the next morning, and that kept me balanced and injury-free. One of the other gym members I had met was a woman who was in her third trimester of pregnancy - her workouts were modified as well. And everything is supervised - Steve makes sure that we have the correct technique, the appropriate weight, etc. Two things you should know about Steve (hi Steve! ): 1) He is gloriously nerdy in his fitness knowledge, and that is so awesome. Sometimes when he tries to explain the mechanics of something to me, I kinda get lost because my brain cannot science at that level. He stays current on all the lastest research, fads, and everything, and it's obvious within ten minutes of meeting him that he really knows what he's doing. 2) It's not just that he's super friendly, but it's really clear how much he loves each and every one of us and how proud he is of us. I'm a very introverted person, and it's not easy to pull me out of my shell. Even so, it was hard to resist the warmth and openness of Anchored. Every time I came in, he introduced me personally to every member I hadn't met yet (well, he still does that, since we have new people joining all the time), and he always has something to share about each of us, which tells you that he actually cares about us as people and not just names on his client list. He gets really excited about our accomplishments, and he is always sharing how we are doing in our training with the other members in the gym (as well as on Anchored's Instagram and FB pages), so we get excited for each other too. And here's something that I personally appreciated: you know how, sometimes when you're with a group of people, and a couple other people in the group start talking loudly about whatever inside joke they have or they start referencing a previous conversation, and everyone else who's listening kinda gets lost and starts feeling really awkward? This happens to me constantly, even among my closest friends sometimes. I'm already introverted to begin with, and this just adds another layer of awkwardness to interacting with other people in large groups. Anyway, I've noticed that Steve totally takes the time to include everyone and fully explain the inside jokes. I've never felt left out or out of place while at Anchored. I feel really comfortable being there, so much so that I will sometimes hang around a bit just to chat with people instead of leaving right away. Because it feels good just to BE there. And when I'm not there (like, during my recent bouts of death plague this winter), I really miss being there. It's kind of an intangible thing, but it's important. We can talk about weightlifting numbers and weight loss success and PRs and goals until we're blue in the face, but members feeling happy and comfortable and actually wanting to be there really is a sign that someone is doing things right. I'm not saying I don't have days when I just want to stay home and take a nap. But when I'm feeling well and generally happy, there's no question that that's where I want to be. Kinda like how I feel about running. So, obviously, I love my gym. But two things happened recently that actually inspired me to write this blog post, one small and one big. They made me realize just how great I have it at Anchored, and I really wanted to write about them. In reading over this list, I realized that Anchored is absolutely a body positive gym, and that is a beautiful thing. I've never felt pressured to lose weight or shamed for not making weight loss one of my goals. I know that that is not the case for other people at other gyms. And this is not the sort of place where I feel like I already have to meet society's standard of beauty in order to fit in with everyone else. I'm not saying there aren't beautiful people at Anchored; I'm saying that it really just doesn't matter. That's not what we're there for. When I say I couldn't have done this without Steve, I'm not just talking about achieving a 315 backsquat. I'm talking about backsquatting anything remotely heavy just a week after dealing with some tremendous pain. I knew we were testing this week, and especially yesterday, I was nervous the entire day. And the question on my mind wasn't "Will I manage to PR? "; it was "Will my body hold up today? Or will I go home a second Monday in a row feeling hurt and broken?" And as you can see, things went well. Through the last five attempts, Steve was there, doing the math for me, reassuring me, checking up on me about any discomfort, helping me with my belt, etc. He pretty much took care of me! I feel so grateful not just because of the PR (which felt great and I still cannot process that I did that! ), but also because I did it safely. So what is the point of this post? I'm not here to try to persuade you to join Anchored (ALTHOUGH...), but I did want to write a lengthy review/reflection about my experiences thus far. And I wanted to show you that working out doesn't have to be a miserable experience. You can, like, love going to the gym, if you find the right place and people to nurture you and strike just the right balance between indulging your whining and pushing you to be your best. For me, that place is Anchored Strength & Conditioning. If you are local to me and interested in checking out Anchored, here are the website, Facebook, and Instagram.